Am I a hunter? What is a hunter? This is what I pondered this gorgeous autumn week while I sat quietly amid aspen trees, thorny rose shrubs, and tall grasses. I was dressed in camouflage, gun in hand, watching for deer. It was archery and muzzle-loader hunting season and I had bought my licence. I reflect on my reticence to self-identify as a hunter. Is it because I lack the experience of my husband who has hunted most of his life? Because much of my experience hunting has been to follow his lead and seemingly reap unjust rewards from his skills? Is it because I’m a woman in a non-traditional role? Or is it because the word itself lends itself to negative connotations in our society? Many people haven’t had a positive role model of a hunter, and may equate a hunter with painful emotions evoked by Disney’s representation of “man” in Bambi, instilled in our psyche at a vulnerable young age. Perhaps they relate it to a media story of poachers who act illegally and without moral compass, but are named hunters rather than poachers. Perhaps you don’t know what to think but you envision people (mostly men) chasing animals in their trucks, carelessly yielding dangerous weapons. None of these sit well with my experience of hunting, but I won’t say these types don’t exist. Merriam-webster defines hunt as a verb meaning to chase and kill (wild animals) for food or pleasure. This seems simple and yet it doesn’t feel like it fits me. I’m not chasing. As for the pleasure component, that is complicated. Do I enjoy taking a life? No. I feel much remorse, awe, humility, and I mourn the loss of the animal’s life. I do what I can to honour its life. Do I enjoy the act of connecting with the natural world in order to harvest meat? Yes. I acknowledge that I am a consumer, whether I buy food at the grocery store, whether I am vegan, vegetarian, or omnivorous. Hunting feels ethical to me, from many standpoints. Even though it is not easy, I want to see the blood on my hands to remind myself for the gratitude with each meal I eat, whether I am eating something I killed, or a plant or animal someone else harvested. I recognize there is an environmental impact of every food we eat, and I weigh my choices with care and intention, backed by years of experience in conservation biology. I consider the health and well-being of the animal’s life before it dies, and how humanely it dies. Yes I guess I am a hunter. What doesn’t sit well with me is the action component of the word hunt. Synonyms are chasing, stalking. When I hunt, I feel like I’m BEING, not DOING. I’m seeing, hearing, feeling, and breathing. I am connecting with the sights and sounds of the natural world. Some might call it a meditation. The earth beneath my body, its temperature and energy ground me. 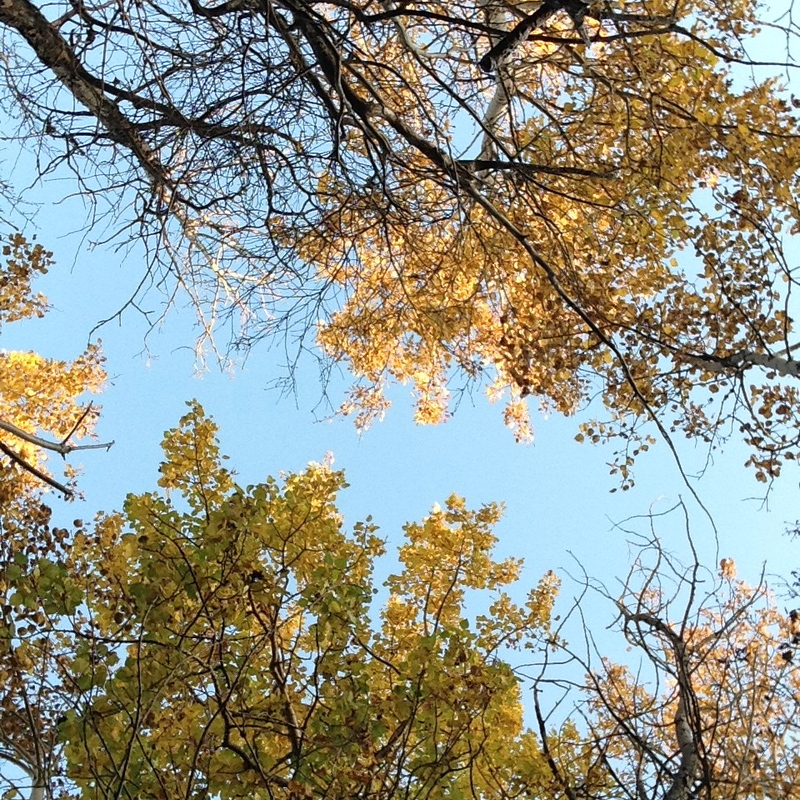 Trembling aspen leaves whisper and echo with a familiarity that tells me I am home. Stillness surrounds me and life abounds simultaneously. Insects work diligently, birds call and soar. Chickadees and juncos feed and call near me, the leaves crunching loudly beneath them. I sit so still that a junco’s wings brush my nose as he flies by. I wonder if the chatter of a squirrel or magpie might teach me who is approaching. I wonder if I will first see or hear a deer when it finally arrives in my field of vision. I find if I stop concentrating intensely, I sense when and where to glance to find a deer approach. I don’t see or hear it, I somehow feel and know it. When I let go of all my pretences and worries about whether or not I am a hunter, I find I’m a person outdoors, excited and enlivened by nature and wild things, and my natural instinct guides me. 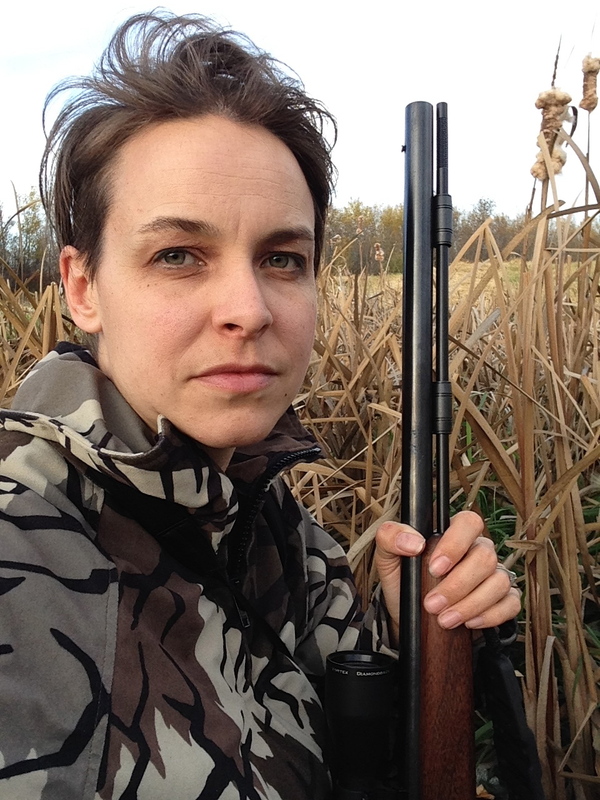 This past week I stopped following my husband and challenged myself to start thinking like a hunter: about wind directions, food sources, seasonality of social behaviours. One night before I fell asleep, I saw a vision of the location I should visit next and followed that intuition. On another afternoon I approached a field and keenly sensed I was being watched and I was intruding. I paused and acknowledged I am a guest and I asked permission to enter. I didn’t know who I was asking, like I don’t know where these messages come from. But I stopped judging myself and started to pay attention. Later that evening as I departed the further depths of the field, I found three moose where I earlier sensed this. On another evening I had the privilege of watching two fawns frolicking in a field, running and bounding after a long day at rest, their doe carefully keeping watch nearby. They passed by me more than once at close range and I did not think to lift my weapon. I had no impulse to separate any of this family unit. My freezer is not empty enough and my time is still abundant. I am grateful for the opportunity to observe while unobserved. There will come a moment I will feel the RIGHTNESS of opportunity and instinct. Something runs deep in my veins that leads me to the hunt, and yes I do enjoy it, but I do not chase. I take much care and focused intention with every moment and I am grateful for the opportunity to witness all the life around me. I recall moments of childhood: trying to trap a cottontail rabbit, building a chickadee feeder, collecting beaver bones, catching wood and leopard frogs. I have become, or more likely that I always was a hunter. I am connected with the source of life. It sustains and empowers me. The challenge has been to push aside my ego and remain true to my instincts.